Award-winning South African chef, Reuben Riffel (pictured) has developed a range of deliciously tasty recipes, featuring South African plums, peaches and nectarines, to celebrate the new season. South African plums, peaches and nectarines are at their seasonal best during our cold winter months until mid-April and widely available in UK supermarkets. Look out for fantastic tasting varieties, such as Rich Lady peaches – a juicy golden flesh peach with a very sweet flavour –, Alpine nectarines – a red blush skin nectarine with a golden tinge and yellow flesh –, or Sapphire plums – a dark purple skin plum with a gold-pink flesh. These recipes are free to use in your publication. 2. Finely chop the thyme, salt, juniper berries and coarsely ground black pepper together, then rub over the duck breasts. Place them in a roasting tin and drizzle with the olive oil. Roast in the oven for 25 minutes, turning once. 3. At the same time, put the butternut squash and olive oil in a separate roasting tin. Season and roast for 20-25 minutes, until golden and tender, adding the plums after 10 minutes, and the hazelnuts for the final 3-4 minutes. 4. Meanwhile, cook the quinoa in boiling salted water for 15-20 minutes, until tender. Rinse with cold water to cool quickly and drain thoroughly. Add the hot butternut squash, hazelnuts, basil, onion, red wine vinegar and olive oil. Toss to combine and season to taste. 5. 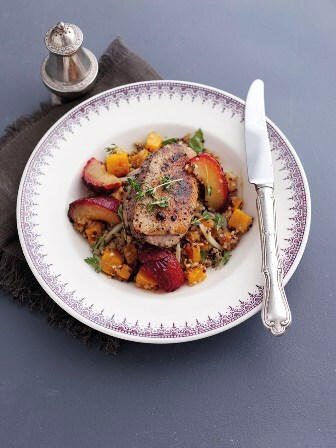 Serve the duck breasts with the roast plums and quinoa salad. Season to taste, drizzle a few drops of balsamic vinegar and serve, garnished with thyme sprigs. 1. Scoop the pulp from the passion fruits into a large saucepan and add the orange juice, sugar, wine and water. Place over a medium heat and stir until the sugar has dissolved. Bring to the boil, reduce the heat to low and simmer for 5 minutes. 2. Add the plums and peaches or nectarines. Cover and cook over a low heat for 5 minutes, or until the fruit is just tender. 3. Cool and serve with yoghurt. 2. Make the topping: In a food processor, add the bread and pulse until fine crumbs form. Transfer the breadcrumbs to a medium bowl and stir in the muscovado or light brown sugar, cinnamon and salt. Add the melted butter, stir well to combine, then set aside. 3. Make the filling: In a medium bowl, combine the plums, sugar, cornflour, salt, lemon juice and vanilla extract. 4. Spoon the plum filling into a deep rectangular or square baking dish and cover with an even layer of the topping. Bake until the plums are tender and look juicy around the edges of the baking dish, and the topping is golden-brown – about 20 minutes. Serve warm or at room temperature.